Conversational commerce- consumer purchase of products and services via voice assistants such as Google Assistant, Amazon’s Alexa, and Apple’s Siri, will revolutionise how consumers and brands interact in ways not witnessed since the dawn of e-commerce. It is so much more than a new interface or an additional channel in an omni-channel world. It promises to be a curator of services and experiences that intelligently meet needs and engage consumers emotionally—anytime, anywhere. We are still at the very beginning of conversational commerce, but the extraordinarily early adoption will drive investment and innovation, consequently enabling an entirely new way for brands to build relationships of value with consumers. These relationships will seamlessly extend across consumers’ relationship lifecycle with brands—from marketing to sales and service—creating an entirely new, more instinctive way for consumers to engage with brands. To investigate the concept of conversational commerce, we conducted some global research, to understand more about consumer perception, usage of voice assistants, and the implications for retailers and brands. We surveyed over 5000 consumers and held focus groups with consumers in the UK, US, Germany and France. Our research findings show that voice assistants are on the cusp of transforming commerce. Outline why voice assistants are about to revolutionize commerce; based on the functions, frequency of use and context in which consumers like to use voice assistants. Analyse why consumers love voice assistants, depending on their needs and preferences. 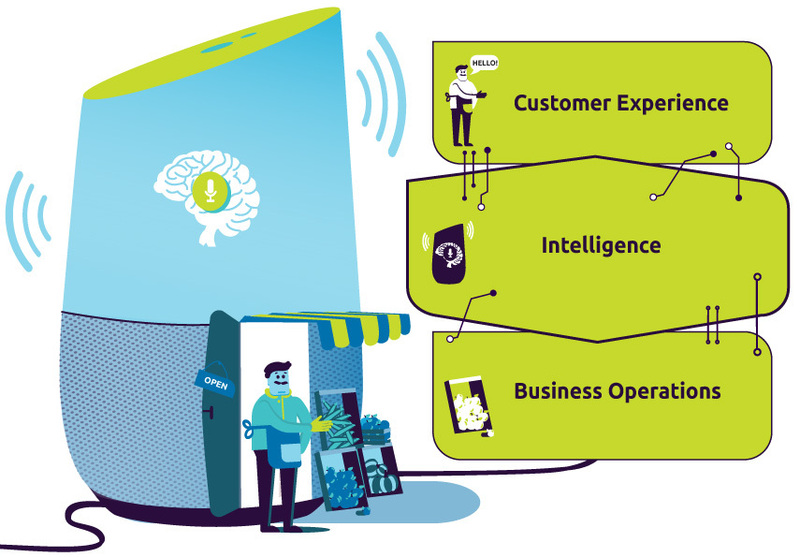 Ascertain the concrete benefits of conversational commerce for retailers, consumer products, and services organisations. Recommend an action plan for organizations to devise a sound conversational commerce strategy. Voice assistants will become a dominant mode of consumer interaction in the next three years: today, around a quarter of people say they would use a voice assistant instead of a website, however, in three years’ time, this is set to rise to 40%. Users have adopted voice assistants for a variety of functions, with predominant usage focused on seeking information and playing music, however this has more recently extended to commerce related activities: over a third (35%) have bought products like groceries, homecare and clothes via a voice assistant. Retailers are already making advances to launch voice shopping via partnerships with tech platforms such as Google Assistant and Amazon’s Alexa, in response to these behaviours: Wal Mart recently partnered with Google to allow customers to shop more than two million items through voice. Voice assistants aren’t just being used for product purchases – they are becoming increasingly popular in the service sector, too, with more and more consumers using voice platforms to order food, book appointments and for bank transactions. Although most interactions via a voice assistant take place in the home, our research suggests that conversational commerce can be used to enhance the in-store experience. Over a third of consumers would be willing to replace customer support or shop sales support with a personalised voice assistant in exchange for a faster, more convenient experience. Consumers who use voice assistants are very positive about the customer experience, with 71% of users satisfied. Speed and convenience were highlighted as the biggest reasons for preferring voice assistants over apps, websites, or physical stores; with 49% of consumers preferring voice assistants over human interactions or call centres, because it is faster. However, there is an element of apprehension in the use of voice assistants: safety and security of personal data is the top concern. The research also suggested that consumers lacked trust that these technologies would make a decision that was in the users’ interests. Providing voice assistants can significantly improve brands’ Net Promoter Scores (NPS®). Among users, the NPS® of a brand would improve by nineteen percentage points when it provides a personal voice assistant globally; highlighting a huge opportunity for brands to drive customer satisfaction among voice assistant users. Our research suggests that this satisfaction is also likely to generate increased spend from consumers – consumers are willing to increase spend by 5% in return for receiving a good voice assistant experience. To derive maximum value from this, retailers and brands should focus on priority consumer segments, who have high affinity for voice assistants and prefer this over the use of a website, app or physical store. How can retailers and brands devise a sound Conversational Commerce strategy? Design and execute compelling voice customer experiences: The conversational experience must be aligned to the target group’s needs and preferences. Apply conversational intelligence to understand your target consumers: Convert customer data acquired through dialogue into usable intelligence and insights, that will further tailor the customer experience. Devise sound business operations voice solutions: Organisations need to ensure robust integration of the voice channel with internal business operations, e.g. supply chain, order management, customer relationship management and marketing strategy. Implement technology solutions that seamlessly integrate the voice assistant experience: Retailers must seamlessly bring together consumer data, technologies, and processes for the new voice channel. Prepare the organisation for the new voice channel: Conversational commerce needs to be a key part of the overall DCX strategy to sustain, scale up and mature within the platform. Conversational commerce represents a significant opportunity for brands and retailers to interact with their consumers in new and innovative ways. Rapid technological advances, coupled with increasing consumer appetite for voice devices, is driving investment and innovation. Brands must harness this interaction opportunity to build relationships of value with consumers across the lifecycle, and offer an entirely new and more instinctive way for consumers to engage with them.